I am so lucky that I have a diverse range of clients. That basically translates to being able to design in a huge array of styles which keeps things fresh for me. I started working with Josh a little over a year ago. He is a talented songwriter and musician based out of Southern California. Oddly enough, I didn’t know him when we lived in California and I only recently “met” him over lunch while he was visiting Nashville. You may or may not know, but my significant other Joshua Ketchmark is also involved in musical endeavors and so by default, I have become more educated on all things that go into recording, promoting, playing live, etc. I am not musically inclined at all, and frankly the process of writing and recording a song is still magical to me. I don’t know how they do it because my brain simply doesn’t think in the same way. But, given my proximity to the process, I know how much time, love and passion goes into creating music…which gives me an entirely new appreciation for what people in musical careers do. 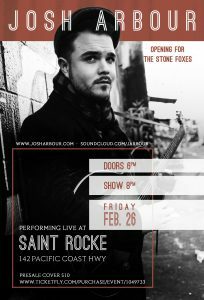 Josh has allowed me to design flyers for not only his personal shows, but also for the Sound Collective shows/artists and the Breakthrough Artist Showcase that he runs at Saint Rocke. I also designed a few promotional items for him like shirts, postcards and stickers. Eventually, he also asked me to help with the Sound Collective website and his personal artist website. In the time that I have worked for Josh, I have seen him do some really cool things. He was a performer in a huge battle of the bands and went to the finals and he has rocked a few other festivals. He has played countless shows in Southern California and Los Angeles. He and his colleague Kira Lingman created, book, promote and host Sound Collective at Saint Rocke which is a weekly event giving newer artists a platform to share their craft. 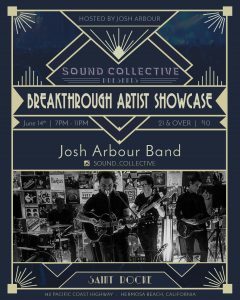 With the success of Sound Collective, Josh was asked to create and host/book another night at the venue and The Breakthrough Artist Showcase was born. At least once a month, there is a themed evening of music such as a Speakeasy, or an Elliott Smith Tribute, or on Valentine’s Day they did a night with a Rocky Horror Picture Show theme. 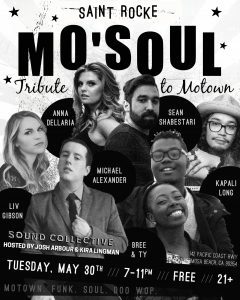 At the end of the month, there is a Mo’Soul night of music. While doing all of this, he still writes and records new music. He plays live both solo and with a band. 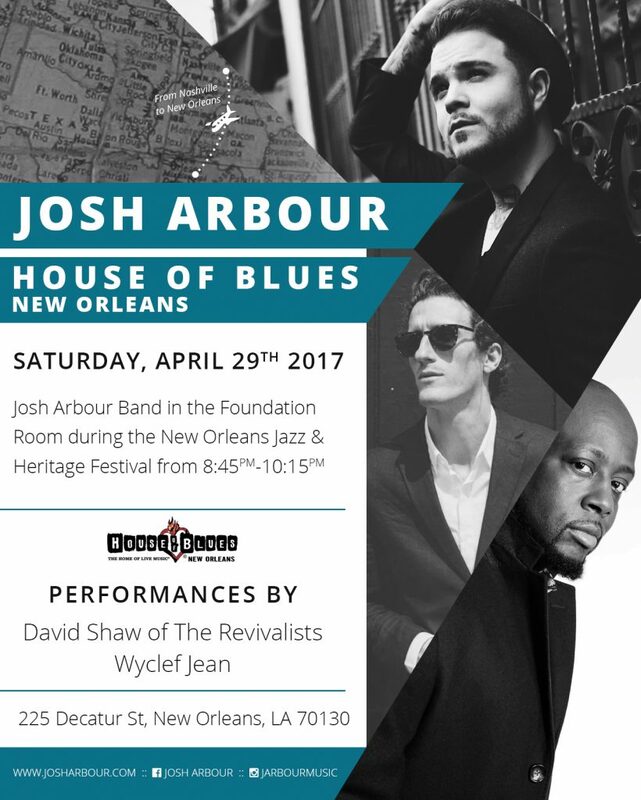 He recently played during Jazz Fest in New Orleans and shared a night with Wyclef. I mean, really. It’s impressive. 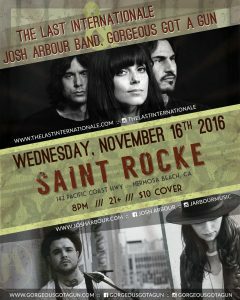 The other day, Josh sent me a link to see a full recording of a special night at Saint Rocke. He preformed with a string quartet. There are original songs and some covers, including Darling Nikki. With a string quartet. Prince. With a string quartet. I (obviously) think this is rad. And there was a harpist. This simply isn’t something that you see everyday on a stage in a rock venue. It’s beautiful and it’s Josh at his finest. I think you should take a moment to check it out, because I don’t think you will be disappointed. Go over to YouTube and check it out! It is always nice to be a tiny part of someone’s brand. It is especially nice, when that relationship expands over time. I am lucky to be a part of the Sound Collective family and the Breakthrough Artist Showcase family. Designing for music and bands is always fun for me because I think music and art go hand-in-hand. It allows me to be a little more edgy and a little more loose with what I design. It is also particularly nice to do things with Josh because all three parts of his business have a unique voice and personality and I get to play off those things. Josh occasionally has a clear vision for what he wants and sometimes he just sends over the show information and lets me get crazy. Either way, he is generally pleased with whatever the flyer design looks like! 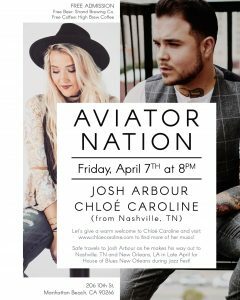 If you want to learn more about Josh Arbour, or download his new single (which was inspired by daily letters his grandmother wrote to his grandfather while he was away at war…romantic, right?!?) go to josharbour.com. Or, find him on both Facebook and Instagram.